We put together a Pottery Barn inspired bedroom using the classic color combination of navy blue and white. We love the Pottery Barn style but often the price is a little out of reach. 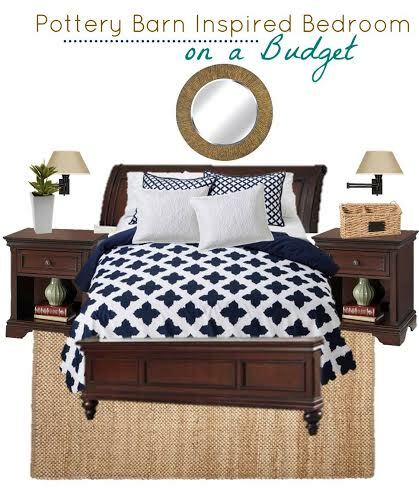 Here is a copy-cat look with decor from Target, Walmart, and Kohl’s. All of the prices were accurate at the time of posting, but we all know they can go up and down quickly! Be sure and check out more of our Pottery Barn inspiration rooms on a budget in our Home Decor category. 1) Xhilaration Reversible Comforter Set, Queen is from Target, compare it to the Kendra Trellis Duvet Cover & Sham from Pottery Barn. 2) The Home Styles Lafayette 3-pc. King Sleigh Headboard, Footboard and Frame Set is from Kohl’s. Compare it to the Hudson Storage Bed from Pottery Barn. 3) The Lafayette Nightstand is also from Kohl’s. Compare it to the Hudson 1-Drawer nightstand from Pottery Barn. 4) The Simplicity Swing Arm Lamp is from Target. Compare it to the Elise Adjustable Sconce from Pottery Barn . 5) The Round Wall Mirror is from Kohl’s. Compare it to the Brussels Round Wood Mirror from Pottery Barn. 6) Simply Shabby Chic Quilted Sham is from Target. 7) Decorative Basket is from Walmart. 8) Nearly Natural Artificial Plant, Set of 2 is from Target. 9) This 5×7 Threshold Area Rug is from Target. Compare it to the Weathered Chenille Jute Rug in Natural from Pottery Barn . What is your favorite Pottery Barn Inspired item? Do you have another home decor savings source to share with us?